Obviously, Ganesh started life in matriarchal prevedic society and was not recognised by the patriarchal vedic society. His brother Karthikeya known by several names like Kumara, Subramanya, Skanda, Shanmuga was recognised by the vedic society. 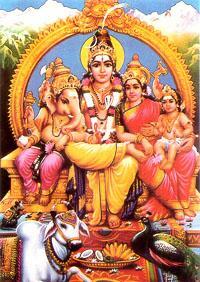 He is identified as Sanath Kumar, the mind born son of Brahma at a time when Brahma was considered as a supreme Deity. When Shiva became the supreme Deity Karthikeya became the mind born son of Shiva. He is described as the commander-in-chief of the army of Devas who destroyed the demons, Tharakasura, Surapadma and Simhamukha, the arch enemies of both mankind and Devas. Like Ganesha, Karthikeya is also a personification of a metaphysical concept. In South India he is called Subramanya (Resplendent light) which is the same as the Huq Nur of the Sufis symbolising divine wisdom. The name Karthikeya is associated with Karthika (Pleiades) group of stars in which one could pick up six faintly glowing stars. According to Greek mythology, King Atlas had seven daughters. Of these, one married a mortal and so lost a bit of her brilliance and became invisible. There are several other stars in the group which can be detected only by a powerful telescope. Alceone is the brightest star in this group. It is said that our Sun which gives us energy to sustain our life is controlled by Alceone and that is the reason why the entire group of Pleiades stars is called Karthika meaning creative force, and Karthikeya is a personification of this force.